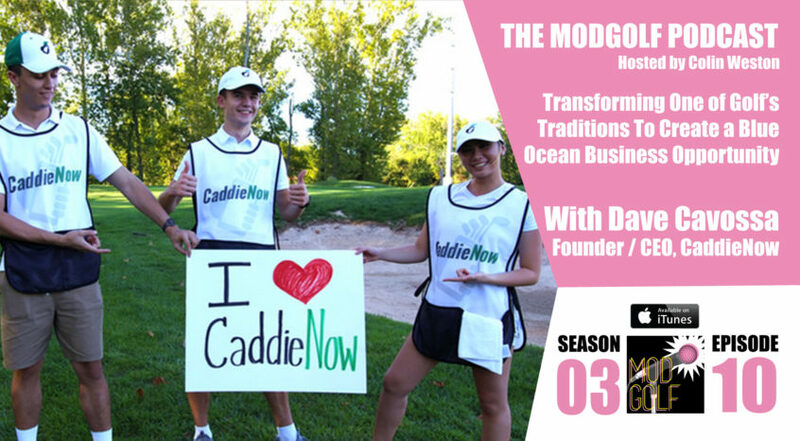 Haymarket, VA (April 12, 2018) – CaddieNow Founder and CEO Dave Cavossa is the featured guest in the newest episode of The ModGolf Podcast, a weekly program that explores the future of golf through conversations with industry visionaries and top influencers shaking up the sport. Because building a vibrant community around the future of golf was his inspiration for creating The ModGolf Podcast, Weston invited Cavossa on his show to recap CaddieNow’s appeal to the crucial 14-20 year-old demographic, discuss the growing, independent contractor caddie trend and provide a history and overview of the popular CaddieNow virtual service. Modeled after the well-known ride-sharing app, CaddieNow is America’s fastest-growing, caddie service platform. It pairs golfers who want a caddie with a true independent contractor, who has the flexibility to meet at the golfer’s preferred time and place. There is no cost to the club to offer the CaddieNow platform to their customers. The virtual service has gained popularity in the industry nationwide because it’s easy for golfers to book caddies, for caddies to find work, and for courses with or without existing caddie programs to offer caddie services at no additional costs. For clubs with existing caddie programs, the CaddieNow Concierge service streamlines operations, reduces costs and, most importantly, includes insurance liability coverage while providing caddies with true independent contractor status. CaddieNow’s platform is customized for each course. This allows every club or course to choose the level of service, pricing and payment methods that works best for its operation. “Our flexibility means clubs continue to have complete control over their programs and the experience they want for their members without the headaches of traditional programs,” Cavossa said. The company started on the East Coast in Virginia and Maryland in 2015 and grew to California and the West Coast last year. It is now in Florida, Ohio, South Carolina and Pennsylvania. Texas became the eighth state, and first in the Southwest, to get CaddieNow. As it continues to expand into new markets, CaddieNow is currently meeting with and signing agreements with new partner courses while also searching for potential caddies to staff its demand. CaddieNow has made it easy for either youths or adults to become caddies. Candidates can sign up and register online at to http://www.CaddieNow.com. Each caddie goes through a three-step process with video and on-course orientation. To use the service, golfers simply download the free CaddieNow app, available for iPhone and Android devices, and register. After golfers enter the course, date and time they plan to play, they receive a confirmation notice from their looper, who will meet them at the course. Fees range from $30 – $80, plus tip, depending on the golfer’s desired level of caddy experience. CaddieNow continues to offer four levels of caddie service: JR LOOPER, LOOPER, FORE-LOOPER and PRO-LOOPER. The company is currently operating on more than 100 courses. CaddieNow is America’s fastest-growing, caddies-on-demand platform. Founded in 2015 and headquartered outside Washington, D.C., its mission is to grow the game of golf through youth caddies and make them widely and easily accessible to golfers of all skill levels at affordable prices. Available as a free download on iPhone and Android devices, golfers enter the course, day and time they want to play and receive a confirmation notice from their caddie, who meets them at the course. The company’s service is operating at more than 100 courses in eight states with plans to add more this year. It is also used by thousands of golfers at tournaments and special events. For more information go to http://www.CaddieNow.com.